Ukrainian Orthodox Church of the USA - A Blessed Journey of 100 Years! A Blessed Journey of 100 Years! One hundred years ago, they arrived – teenagers and young people barely out of their teens – to find a better way of life in a new land. Most came alone, leaving parents, friends and all that they held dear and called home. They brought very little money with them and few tangible items; they did, however, bring treasures beyond measure! They brought their heritage, their customs, their traditions, their desire to work hard and, most importantly of all, they brought their faith in God and their desire to worship Him according to the traditions of their forefathers. 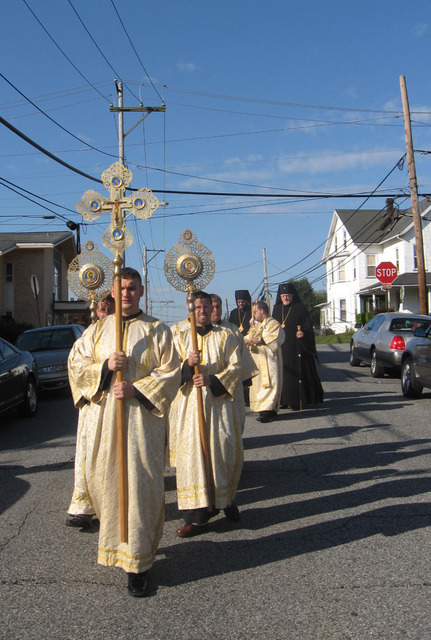 This is how the Holy Ghost Ukrainian Orthodox Church in Coatesville, PA was founded. 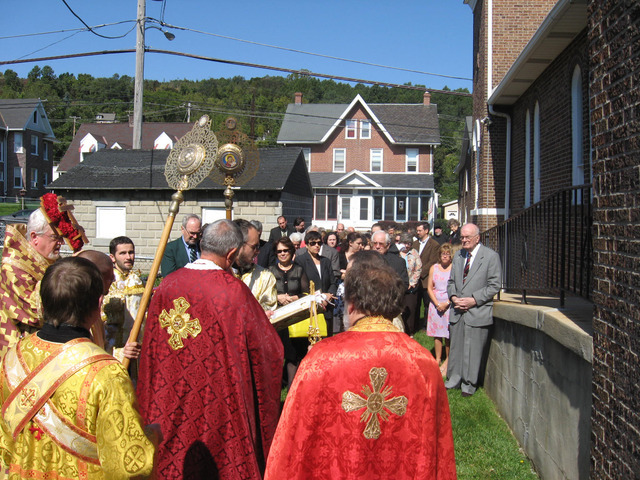 The “warm” and “passionate” “family” that is Holy Ghost Ukrainian Orthodox Church in Coatesville, PA celebrated 100 years of service on October 3-4, 2009 with a two-daylong schedule of events, opening with a Vespers service on Saturday, October 3, 2009. 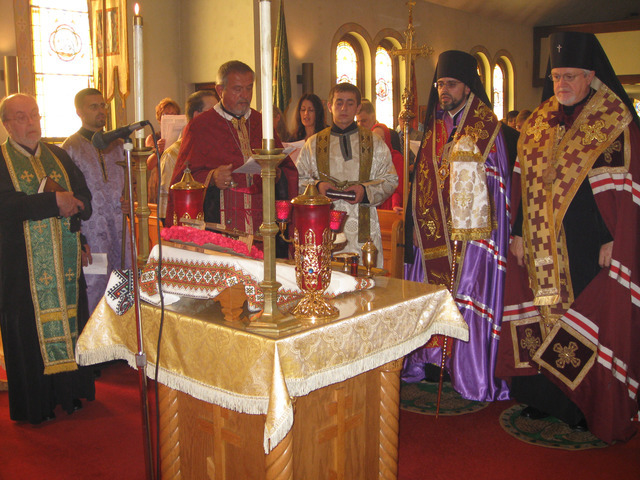 Archbishop Antony, the Ruling Hierarch of the Eastern Eparchy and the President of the Consistory of the UOC of the USA arrived to Coatesville, PA on Saturday, October 3rd to preside over the prayerful celebration of the parish’s ministry. 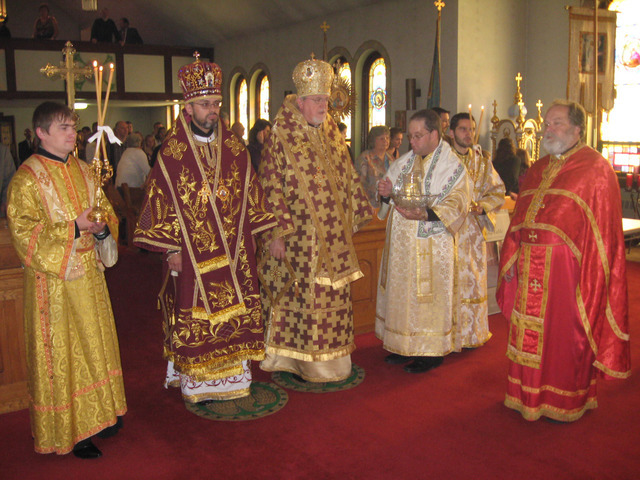 Upon the invitation of the parish family and with the blessing of the eparchial bishop, the Ruling Hierarch of the Western Eparchy of the Church, Bishop Daniel traveled from Chicago, IL to share in the celebration of “faith, hope and love” as these Christian virtues have been and continue to be practiced among the faithful members of the parish family. 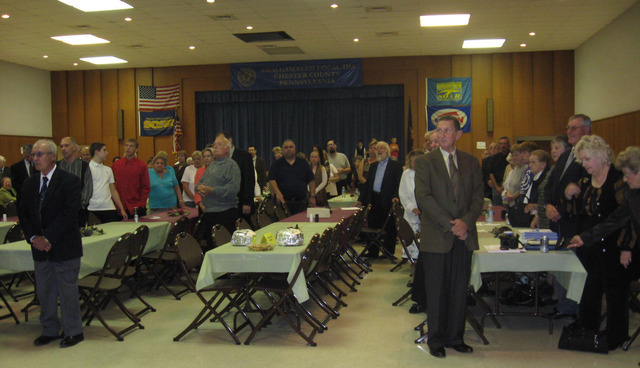 The Vespers service began the Saturday night’s celebration of the parish’s prayer and ministry in the town of Coatesville and the neighboring communities. The pastor of Holy Ghost Ukrainian Orthodox parish, Very Rev. Fr. 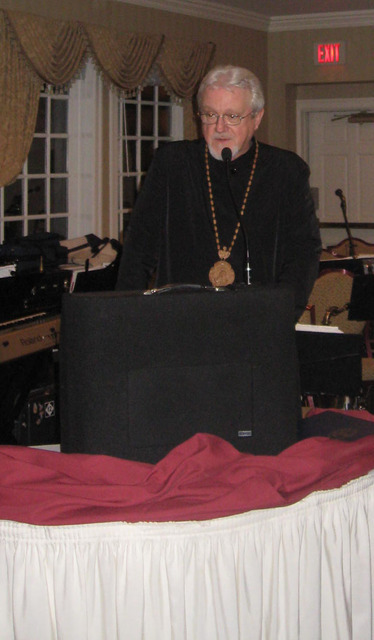 Anthony Ugolnick, Protoprpesbyter Frank Estocin, pastor of St. Volodymyr Ukrainian Orthodox Cathedral in Philadelphia, PA and Dean of the Philadelphia Deanery, Very Rev. 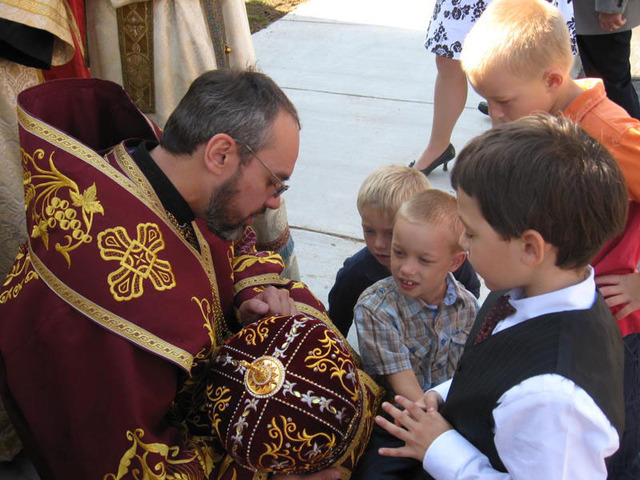 Bazyl Zawierucha, pastor of Holy Assumption Ukrainian Orthodox parish in Northampton, PA, Very Rev. Fr. Stephen Hutnick, pastor of Sts. Peter and Paul Ukrainian Orthodox parish in Wilmington, DE, Rev. Fr. 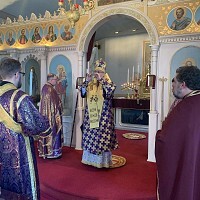 Gregory Czumak, pastor of the Four Evangelists Ukrainian Orthodox Mission in Bel Air, MD, all welcomed the hierarchs at the front doors of the parish temple, asking the spiritual fathers of the Church to remember in their prayers the previous pastors and founders of the parish family. During Vespers service, His Eminence Archbishop Antony, upon the request of the parish family, recognized prayerful ministry in the congregation of Fr. 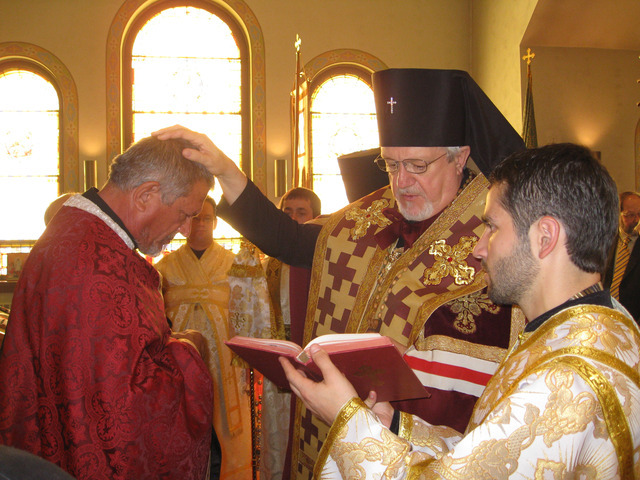 Anthony Ugolnick and elevated him to the rank of Protopriest, with a rite to wear a “gold” cross. During his sermon, the Archbishop spoke of the devotion and dedication of the parents, grandparents and in some cases the great, great, great gandparents of today’s parish members, who had our Lord Jesus Christ and His Church as the very center of their lives and determined the rest of their lives by that, which was taking place at the Church. The bishop said that Christ and the Holy Spirit never failed the, but only strengthened the, and guided them through the most difficult of times. He called upon the faithful of 2009 and beyond to emulate their predecessors in enriching the legacy they received from their predecessors and passing it on to their descendents. He reminded the faithful that in God’s eyes each and every one of them is more precious than any earthly treasure – worth dying for as His Only-begotten Son did on the Cross for us. 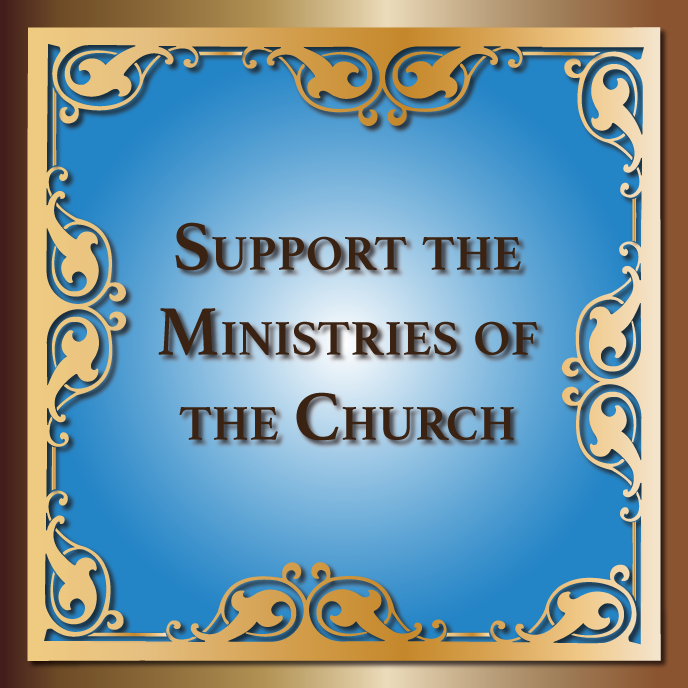 Each person must contribute his or her part to the common work of the parish community – the worship and community service that identifies who they are – children of God’s Love – a love that must always be shared and gifted freely and without hesitation or any strings attached. Following the Vespers service, the hierarchs and over 200 clergy, faithful and visitors to the parish shared in a festive banquet, organized by the parish family. Lauren Bentley, the president of the parish board of administration and Tabitha Houck welcomed the guests to the celebration, reflecting upon the blessed history of the parish community. Looking through the pages of the commemorative jubilee book the attendees learned about the various ministries of the parish family throughout the past 100 years. 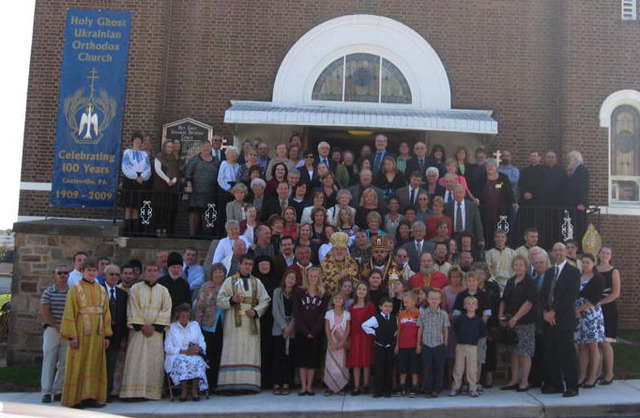 Such parish organizations as St. Anastasia Sisterhood, Holy Ghost Senior UOL chapter, Elders of the parish family, the Church School, the Altar servers and members of the Church choir have selflessly contributed to the growth and spiritual ministry of the parish congregation. The clergy in attendance expressed their sincere greetings on behalf of their parish families, commenting on the positive ministry of Holy Ghost UOC in the mission and the work of salvation of souls of the Holy Ukrainian Orthodox Church of the USA. Fr. Anthony remembered the parish priests who came before him and expressed his gratitude to the bishops and faithful of his parish family for honoring them as they honored Fr. Anthony in the elevation he received. He expressed his hope that he will always live up to the example of those preceding pastors and spiritual fathers to this Holy Ghost community. In conclusion of the celebration, at the centennial luncheon, the president of the parish board president Lauren Bentley and the pastor of the parish family, Fr. 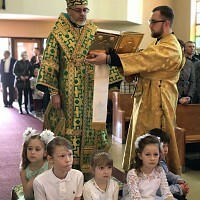 Anthony Ugolnick presented a gift to the Church through Bishop Daniel, who leads the college student mission trips to Ukraine - a check for over $3,000.00 towards the ministry at the three Ukrainian orphanages that the UOC of the USA has adopted. Expressing the gratitude of the Church for this generous gift, the Bishop provided an update on the progress of the orphanage adoption program and commented on the parish’s dedication and willingness to share their blessing with those in need. 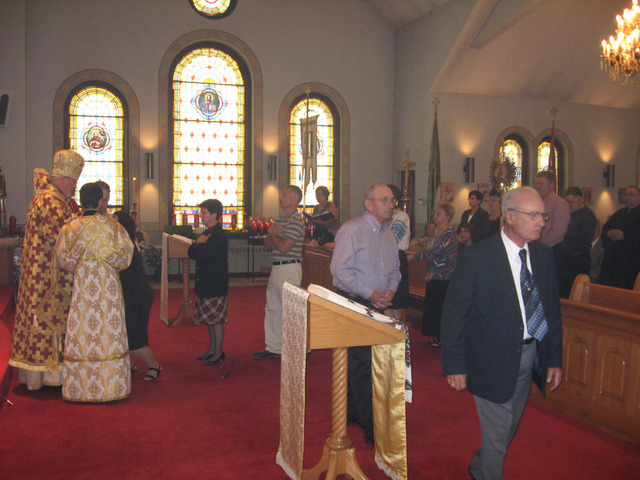 Through the consistent, dedicated work of it’s pastor parishioners and the Will of God, Holy Ghost parish in Coatesville, PA not only survives but thrives. This Centennial celebration joyfully commemorated those who came before, those who work in the present and those who shall take the torch of Faith in the future and ensure the living spiritual legacy of the parish family. OCMC: Share in a Journey of Faith: Join a 2010 Mission Team! Happy and Blessed New 2019 Year of our Lord! Many Blessed Years Metropolitan Antony! Axios!